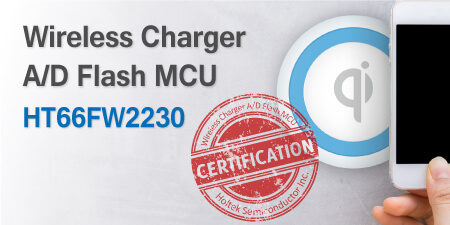 Holtek’s HT66FW2230 is a dedicated MCU which is specially designed for the wireless charging application area. The device includes both high resolution frequency control and current measurement circuits, which are the key features of any wireless power transmission control. Being specifically directed at WPC communication protocol, this new device provides signal demodulation and decoding circuits, thus allowing for great reductions in external circuitry when implementing SoC (System on Chip) architecture. When integrated together with suitable external components, product differentiation can be readily achieved by adjusting the internal device parameters according to the user’s product specifications. Holtek is therefore delighted to announce that its HT66FW2230 reference design solution has passed the WPC latest version V1.2.3 certification. This certification includes power transmission control, communication protocol, metal foreign object detection and product compatibility testing. In addition, this reference design solution also provides a Demo Board and a complete set of development data which enables designers to develop their products more rapidly and efficiently.